Some rules should be broken at every opportunity such as "the Pulitzer Prize committee never gets it right" and "a sequel is never as good as the original." Mike Wallace shatters both sage sayings with this second volume to the Pulitzer Prize winning Gotham: a History of New York City to 1898. He worked on the first volume for over 20 years and co-authored it with Edwin G. Burrows. The first volume took the reader from the Dutch outpost of New Amsterdam to the vibrant wild Gilded Age metropolis on the Hudson, through furs, pirates, the Erie Canal, military occupations, wars, peace, and so much more. New York desperately sought to catch up as a real government as fast as its economic and population growth. 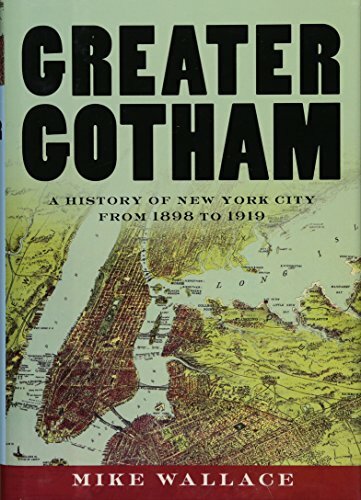 This second volume Greater Gotham: a History of New York City from 1898 to 1919 covers a completely new world. It has five parts that look at that New York in very different ways. Each "vantage point" has subdivisions by different aspects such as cultures. Those years made Coney Island, Ellis Island, Hart Island, Riker's Island, and Staten Island all famous, as well as the Battery, Broadway, Fifth Avenue, and Times Square, but for different reasons. Greater Gotham is better organized than New York in the years covered. To tell the city's history honestly and thoroughly required a special talent for structure. If "the city worked," Wallace writes, "depended upon which New York you looked at, which New Yorkers you asked." He notes that even "the city's corporate class was by no means monolithic." The book opens with a city of unimaginable greatness and tragedy on a rapid rise with the country as a whole to even more. It starts with people of all classes and colors turning out for one of the city's innumerable celebrations in 1897, this one for consolidation "into a truly imperial metropolis, whose monumental buildings and elegant boulevards would proclaim the grandeur and glory of the coming new age." New York prepared to become the world's second city but also the "unofficial capital of the country." It's "Guinness Book of Records" achievements included the "largest urban consumer market. . . . corporation, museum, theater, racetrack, baseball stadium. . . . prison population, system of charities, public work force, and municipal debt" among many other negatives and positives. Wallace outlines the "long civic tradition for Gothamites to take to the street." The most cosmopolitan of cities had organizations, too many to even list, to fill the streets as members of groups that made up another side of the big city. Such events repeatedly and briefly brought the city's mind-numbingly different interests and societies to together to celebrate their grand community as almost one people. Greater Gotham goes far beyond the streets of New York. The steel industry that made America the world's superpower, for example, began on paper in the New York town houses of Andrew Carnegie, J. P. Morgan, and John D. Rockefeller. Conspiracies that created wars, economic depressions ended, and empires began in those same homes and offices. New York magazines and newspapers set the standard for the United States and the world. They made the city's "Cheopsian construction projects," institutions, personalities, and streets renowned but, while exposing the city's problems with corruption, ethnic conflict, poverty etc. They "were long on description" but "they were short on prescription." New York City is also the story of its great hinterland. That would fill another very thick book, however, to have added the contributions of Connecticut, New Jersey, and upstate New York. Illustrations in Greater Gotham are ample but judiciously chosen because of the vast number of images available. Over 100 pages provide sources and detailed indexes. The book is immense and complicated like its subject but a remarkably fast read. The author tells an entertaining but thorough history. Despite the immensity of his subject, however, Wallace never skimps on color or detail in covering "both the merited and misleading." A reader feels like a participant in this book. Especially for the many lovers of the Big Apple, it is dangerous to "take a bite" out of a part of Greater Gotham as you cannot stop once you join this history's many different crowds and noise. What better way could one take a journey in an easy chair?